No matter the results of Game 5 in the Stanley Cup Final on Thursday, the Capitals' have something huge to cheer for: One of their young fans announced she'll be watching the game cancer-free. Addy Flint says she didn't know much about hockey after she was diagnosed with kidney cancer at age 4. 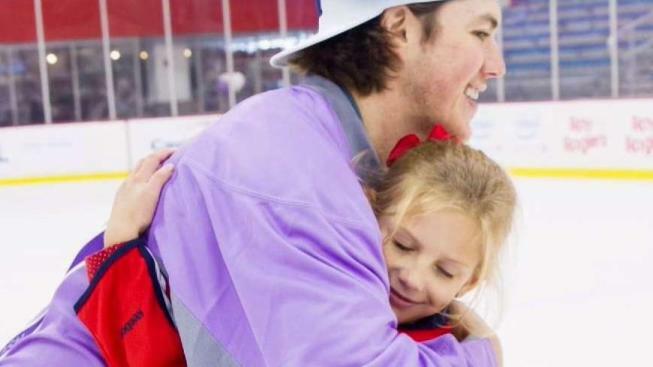 But when she met Capitals' right winger T.J. Oshie at a Hockey Fights Cancer event in 2016, they became fast friends. "Right when I saw her in the locker room, her face lit up and my face lit up seeing how excited she was," Oshie said. When Addy went back into the hospital for a second battle with cancer, Oshie had her back. She visited him at practices, waving from the sidelines. And she cheered on her favorite player — even from her hospital bed. "I'd just watch the games in my hospital bed and it would take my mind off what was happening in the room," she told News4. Addy's mom, Stacey Flint, says Oshie's toughness on the ice and fun-loving persona out of the rink reflect her daughter's own battles. "That's just a parallel to who she is," Stacey said. "And the fight that she has to have whenever she's in treatment." As Addy and Oshie's friendship flourished, the Capitals have racked up win after win, ultimately bringing them to the Stanley Cup Final for the second time in the team's history. Maybe it's all due to Addy's good luck charm, a pair of ladybug earrings. "Every single game that I wore them to we won, basically," she said. "The majority of the games." It appears that the good luck flows both ways. Addy's mom announced before the game that she'll be watching cancer-free. "It's really incredible that I can just go back to doing normal kid stuff now," she said. And in one tweet just hours before crucial Game 5, Oshie thanked his bestie and good luck charm.